Organising for freedom of movement and equality for all! In 2006 Genevieve Adetoro was arrested while at work. Like many others, Genevieve has been criminalised for doing nothing other than trying to make ends meet and provide for herself and family. She took on work in 2004 following her husband being diagnosed with vertigo and a heart condition. She was sentenced to imprisonment in 2007 and whilst inside suffered a stroke. But Genevieve’s ordeal was only just beginning. Once she had served her sentence Genevieve was not released back to the care of her family and community in Luton where she has lived since 1996, rather she was transferred to Yarlswood Detention Prison (or what the government calls an Immigration Removal Centre) where she has been incarcerated since 10 July, 2008. She is now subject to potential deportation, although as far as we are aware removal directions have so far not been issued. Since her stroke Genevieve’s condition means that she should have access to 24 hours a day care. She is paralysed on her left side and in a wheel chair. She has Cranio-Vertebral Anomolies, Angina, Hypertension, Cell Anaemia, Osteo Arthritis and Depression. She takes 15 different kinds of medicine a day. She is dependent on others for help with her personal care, such as bathing, feeding and dressing. Genevieve has no assigned carer at Yarlswood. Instead she has to rely on the goodwill of other migrants imprisoned at Yarlswood for support. There are times when she has been left in her incontinence pad unable to change it herself. Sometimes she has missed meals because there was nobody to support her. Sometimes, other inmates have been woken up at 3.00am to assist her. The officer then proceeded to lift Genevieve all by herself on to her bed. Another fall resulted in her being taken to hospital. When she was discharged at about 1am the Doctor asked if they have transportation to take her back and the detention centre guards said yes. However, the transport used was completely inadequate. Instead of a specialist vehicle a mini-bus usually used to transport visitors to Yarlswood was used. Genevieve was then lifted by three guards into the bus. One held on to the right leg and the other the left foot while the third put his hand around her armpit covering her bust and threw her into the van at the count of three. There was no seat belt so she had to lie on the lap of one of the guards for the one hour journey back to the centre. The same procedure was used to take her off the mini-bus on arrival at the centre. All of this was excruciatingly painful for Genevieve and went against all protocol for how someone in her condition should be treated. Following visits from friends and family Genevieve has sometimes had to wait over an hour for someone to take her back to her room sitting in a puddle of urine. She has developed bed sores and rashes. Genevieve finds her situation extremely frustrating and it is taking its toll mentally. She has expressed the wish that she were dead. Not surprisingly it is the expert opinion of several Doctors that detention is no place for a person in her condition. Genevieve has not seen her children since her incarceration and her husband is worried about the emotional effect it will have on them seeing her in such a poor state. Recently a judge refused Genevieve bail on the grounds that her house needs to be adequately fitted with equipment before she can go home. Social Services went to inspect the home but because of her legal status said they could do nothing to help. Catch 22. Most absurdly, the UK Borders Agency have argued for her continued detention stating that Genevieve is likely to abscond. Ye you heard correctly. A wheelchair bound, physically disabled person, who can hardly move out of bed without support. The mind boggles. “I know our contract staff in removal centres provide care with the utmost sensitivity and compassion in really difficult circumstances, because I have studied the situation at first hand. It’s why medical care at a removal centre is as good as it is on the NHS. Who’s he trying to fool? And if Genevieve’s word isn’t good enough for you, only last month we reported on the announced inspections of two privately run detention prisons, one of which was Yarlswood, which provided damning evidence of the treatment of those incarcerated within them and the poor level of health provision inside. If Genevieve were to be deported she would be subject to the kind of ‘double punishment‘ that is typical of the increasingly punitive migration regime that is emerging both within the UK and across the whole of the EU. While these forms of deportation have been in place for some time, recent legislation has tightened things even further. 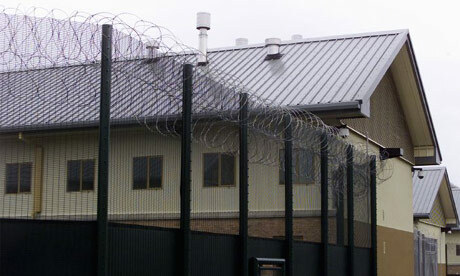 Since August 2008, as part of the UK Borders Act 2007, ‘Non-British’ and ‘non-EEA’ citizens, who have been sentenced to a year or more in prison, regardless of how long they have been in the UK and regardless of how valuable their work is to the local community, can, following their prison sentence, be deported. Unless, that is, they can show that this would breach their human rights, which is far easier said than done. Even those with a British born partner and children can be deported, with the partner and child expected to uproot themselves to live wherever their partner or parent is to be deported. Don’t let this happen to Genevieve and family! For ways in which you can help Genevieve check out ncadc’s website. Check out here for a succinct overview of the legal ins and outs of ‘double punishment’. ANTI FGM DEMO IN CARDIFF TODAY: Maimuna & Josephine Must Stay! No Borders South Wales – day of action in September! No Borders South Wales meeting postponed by a week. ‘Driven to des… on A sick, sick regime!